Mendoza is located in the desert region of Cuyo, next to the Andes mountain range and its one and only Aconcagua. 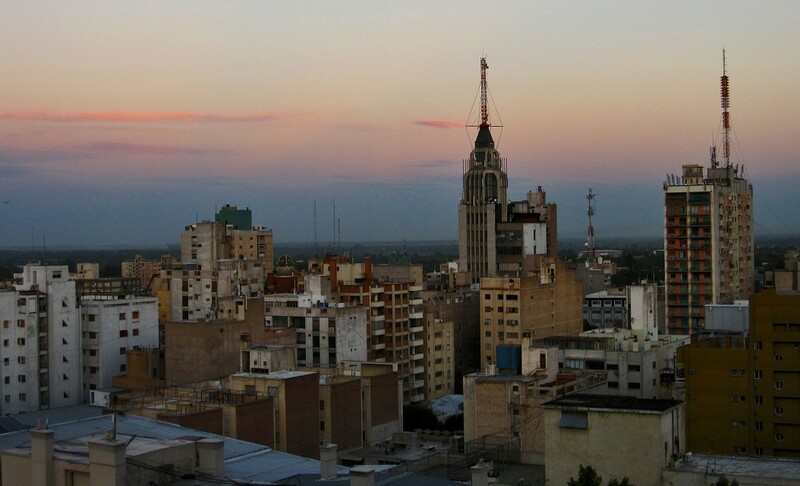 Home of world-renowned wines and ideal for sports such as hiking, cycling, skiing, rafting, and sightseeing, it’s considered by Argentines to be one of their cleanest, most gorgeous cities, as well as ‘the universities city’ because of the number of such buildings. However, Mendocinians mostly refer to their province as ‘the land of sunshine and good wine’. This city was founded twice in two different locations, with the second one becoming the permanent settlement. The Huarpes were the original inhabitants of the region, and they were, in fact, the creators of the artificial irrigation system today known as ‘acequias’. 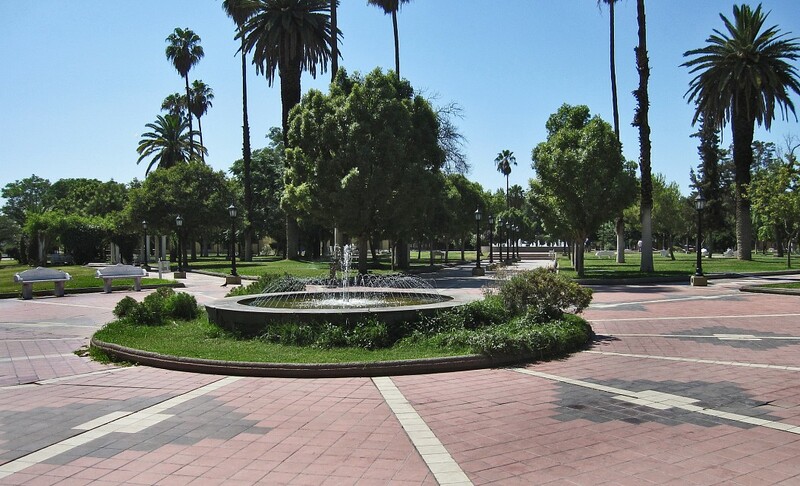 Mendoza is famous for being a functional man-made oasis. A massive earthquake destroyed most of the city in 1861, so it had to be rebuilt with strict earthquake-resistant materials, incorporating in the process a far more modern design which focused especially on huge squares surrounded by avenues and slightly smaller squares. Every street is lined with leafy trees. Though it may not look like it, it’s still a very dry desert, so during the daytime the temperatures run quite high, and when the sun drops, they follow suit. The town may not yet be a full-blown metropolis, but it is well on its way of becoming one, already offering a wide range of activities for you to indulge in. Downtown Mendoza is not very big in itself, but the Peatonal is a great place to start if you’re looking to enjoy a drink or a meal surrounded by all kinds of cafés and musical shows (particularly on Saturday mornings). There you can also find several tourist-oriented shops that offer not only equipment for whatever activity you want to experience, but also city, wine, mountain and bicycle tours. In Plaza Independencia, the main and largest square, there are hundreds of craft stands to buy things that range from leather sandals and beaded necklaces to wire sculptures, handmade clothes and stuffed animals. In Arístides Street, as well as San Martín Avenue, you’ll find all sorts of exclusive fashion brands, electronics stores, and libraries. If you fancy visiting museums, you can head to the Museo del Área Fundacional in Plaza Pedro del Castillo (named after the original founder of the city), a natural history museum in the breathtaking General San Martín Park called Museo Cornelio Moyano, the Mendoza Museum of Modern Art, located under Plaza Independencia, and many more, such as the Museo Nacional del Vino, located in Maipú, southeast of Mendoza. Some wineries are museums in their own right, but these are at least 6 miles away from the downtown area, so you should plan ahead for those visits. A great way of getting to know your way around, besides purchasing a map, is visiting Terraza Mirador, on top of the city’s municipal building. There you can obtain a panoramic view not only of most of the city, but also of the mountains. The Cerro de la Gloria, a hill located behind Parque San Martín, is also a popular spot to visit, providing a lovely view of the sunset, and often hosting musical shows and offering small tours. The local zoo and the Greek theater are located here as well. The two main malls in Mendoza are Palmares Open Mall and Mendoza Plaza Shopping, yet there are tons of smaller galleries strewn around the downtown area, particularly near the Peatonal. It’s very important to keep in mind that in Mendoza, the afternoon nap (or ‘siesta’) can be considered sacred. Unless you’re in a shopping mall or a supermarket, you’ll see shops and restaurants religiously closing at around 2:00 p0 feet and reopening at around 5:00 p0 feet It’s best to chill during those afternoon hours –the city sometimes resembles a ghost town– or to enjoy the refreshing parks you can find everywhere around you. Festivals of all sorts are often free and celebrated in squares very frequently, no matter which neighborhood you are visiting. There are two things you cannot (and should not) stop relating to Mendoza: wine and the annual Fiesta de la Vendimia , which attracts people from all around the globe. The much-publicized Wine Route is a tremendously popular attraction: tourists will visit several wineries, either by bus, bike, or car, and taste the excellent wines that are Mendoza’s pride around the world. There are so many activities related to wine, wineries, and vineyards, organized by specialized guides or at your own preference, that one barely knows where to start, and said activities only increase when Vendimia draws near, in late February and early March. Vendimia celebrates the grape harvest and includes a sort of beauty pageant in which 17 queens, each representing a different department of the province, compete to be crowned. As for sports, Mendoza specializes in high mountain, as well as extreme, pursuits. Well-known companies are pros at offering outdoor activities such as expeditions, horseback riding, trekking, and exciting rafting adventures on an everyday basis. If you want to ski, July and August are your best options. During the summer, though, you can also do some spectacular sightseeing in and around the closed ski resorts. Nightlife in Mendoza appears in clusters. The places that truly come to life at night are the clubs in Chacras de Coria, lined one after the other at the sides of the road leading to Potrerillos, Arístides Street, full to the brim with bars and restaurants, and some alternative places such as La Reserva and San Martín Sur Street, which holds more clubs than restaurants. Nevertheless, restaurants and food joints of all kinds flourish in those zones, from the traditional parrilla to a regular McDonald’s or a hotdog stand. Colón Street is more known for its cafés and 8-ball pool halls. Getting around the city is fairly easy. If you don’t want to walk, you can always take buses (the system is quite complicated to understand at first, so a bus map is a must), taxis, the Metrotranvía, trolleybuses, and an antique tramcar that circles Downtown Mendoza for very cheap prices. To pay for your fare you need a Redbus card, which you can buy and charge at the bus terminal and in kiosks. All of those modes of transport will surely get you wherever you plan to go, even if you have to walk a block or two to the desired destination. Buses cruise around until around midnight and restart their shifts at five in the morning. Bike rentals are also a big thing in Mendoza, as there are a lot of well-kept bike lanes that run across most of the city. As for lodging, it comes in the form of hostels dispersed all over the city, some very expensive and others extremely cheap, five-star hotels such as Sheraton and Hyatt, more economical hotels, generally in the downtown area, or apartment rentals, as well as guest houses. With the exception of hostels, it’s a good idea to book ahead and check the house, apartment, or room you have rented before paying. In or near the mountains (Potrerillos being a good example of such a place) there are also marvelous camping spots and cabins that are always open to the public. Besides, there you can try more traditional, usually homemade, food, such as locro and empanadas. 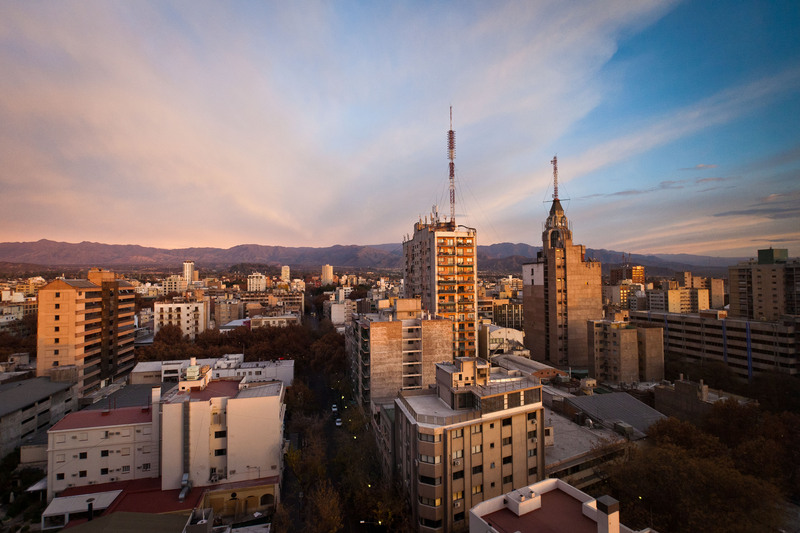 While Mendoza is a rather safe city, there are, of course, certain gray areas you want to avoid, like the bus terminal after midnight, any square past one in the morning, and some downtown streets and neighborhoods that are safer while there are lots of people around. A good way to tell whether a street or a zone is safe or not is to look at the amount of people hanging around there. If it empties at this or that hour, or everyone leaves at pretty much the same time, as it happens in most downtown blocks after midnight, then you’d do well to follow their example. Certain bus stops and routes should be avoided at night. On the other hand, you should be able to avoid major dangers as long as you’re careful. Be discreet and don’t flaunt expensive technology, particularly cellphones, nor jewelry or money; always keep your backpack and/or handbag close to you and don’t leave them sitting on a spare chair or leave things like wallets or iPods on tables unattended. Pickpocketing is very common, as is minor theft, especially in very crowded or touristy areas such as Peatonal and Arístides Street. Don’t let your guard down and you’ll be alright. These, however, are basic precautions you should always take, no matter where you are. Mendoza is a wonderful, lively, well-kept city with dozens of activities to do and things to see, no matter what you’re interested in, be it wine, sports, shopping, sightseeing, partying the night away in a club, relaxing under the shadow of trees, going to the theater or enjoying an open-sky concert in a park that gives Central Park a run for its money. Enjoy!